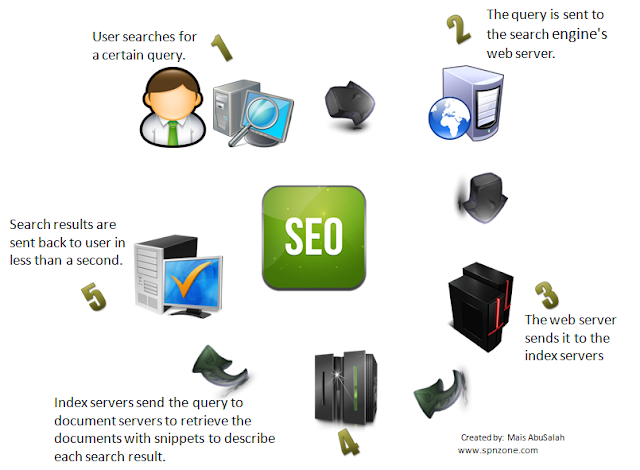 to your site, in order to get good rankings on search engine results pages for certain targeted keywords. It only affects organic traffic, not paid traffic. Google currently has about 200 factors in their algorithms that determine how sites will rank. To Increase the number of visits to our site through search engines. To get more targeted visits to our site. 1- User searches for a certain query. 2- The query is sent to the search engine's web server. 3- The web server sends it to the index servers, where the content is similar to the index at the back of any book. 4- Index servers send the query to document servers to retrieve the documents with snippets to describe each search result. 5- Search results are sent back to user in less than a second.